In this article Kerk Phillips looks at “hurricane economics”. Natural disasters are bad. They destroy lives and wealth, and that has no upside. After the disaster is over, people are unambiguously worse off than before, and while their quality of life inevitably recovers, on average they are not better off in the long run for having lived through the disaster. On an individual basis, it is possible for some people to be better off in some way as the result of a natural disaster. For example, my house might collapse and burn if there were a major earthquake in Utah Valley. Since I have pretty good home insurance, my home would eventually be rebuilt and that would mean replacing my rusty, unreliable old swamp cooler. In terms of my cooler, I would be better off. But given the choice, I would prefer to live with the old monster on the roof and not have to deal with a major earthquake. Big shocks like disasters also have redistributive effects. When a large number of homes are destroyed, it may well be that previously underemployed construction workers end up better off. But in net, their benefit is more than canceled out by the loss to the rest of society. The myth that disasters are good for the economy comes from a misunderstanding about what economic activity measures. The most commonly watched measure of economic activity is gross domestic product, or GDP. GDP measures the value of goods and services produced within a specified geographic area over a specified period of time. Roughly speaking, GDP is equal to aggregate income because the funds used to purchase these goods and services are funneled back to households in the form of wages, stock dividends, interest and rental income, and small-business profits. However, GDP and income are not good measures of well-being. Economists use the term utility to refer to this. To see that income is not utility, consider the case of a retired worker with all his savings in the form of cash. This person has zero income, but if he is buying goods and services with his savings, clearly he is not as bad off as a homeless person who also has zero income. Perhaps wealth is a better measure of utility (though that has problems, too). When a disaster strikes, it does spur GDP. People work to replace damaged homes and businesses, and that will lead to an increase in income to workers and suppliers of building materials. However, wealth has been destroyed. The resources, time and effort that have been used to rebuild and raise GDP could have been used for some other useful purpose had the natural disaster not happened. Like many things, this is easier to see if you think of a small-scale example that affects only your own household. If you wake up on Saturday morning and the storage shed in the backyard has collapsed, you will get to spend the day rebuilding it rather than watching college football. Your home production or GDP will have risen since you built or rebuilt a shed. But in the end you would have preferred to spend a leisurely Saturday watching TV. Your utility is lower even while GDP has risen. One of the easiest ways to see that disasters are not good for the economy is to realize that they are easily simulated. We could replicate the effects of an earthquake or storm with well-placed explosives. No one seriously proposes blowing up otherwise useful property as a form of economic stimulus, however. Ultimately, the terminology we use is the best evidence. We call earthquakes, storms, hurricanes, floods and wildfires “disasters,” after all. If someone comes along and knocks your house down and you rebuild it. 1) Are you better off? 2) Worse off? 3) The Same? The answer to that question is “it depends” are you insured for the full value? If not you are worse off because it will cost you money just to get back to where you were. If you were insured for the full value you are still worse off because even though at the end you will have an equivalent house you will have been inconvenienced during the rebuilding process and some sentimental objects will have been destroyed but strictly financially speaking you could be neutral unless your homelessness caused you to miss work etc. What about the world as a whole, is it better or worse off? As a whole the world will still be worse off. In general terms, the insurance company will be $150,000 poorer but on the plus side the contractor will be $50,000 richer for rebuilding your house. Net balance for the world -$100,000. Economics in One Lesson: The Shortest and Surest Way to Understand Basic Economics By Henry Hazlitt- This is one of the great books of all time to understand economic theory. When There Is No Doctor: Preventive and Emergency Healthcare in Challenging Times Gerard S. Doyle is a practicing ER physician on faculty at the University of Wisconsin School of Medicine and Public Health. He is also a certified public health-trained disaster planner. Kerk Phillips is an associate professor of economics at Brigham Young University. 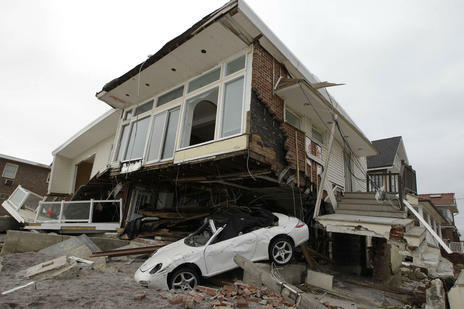 This article was originally published by the Deseret News under the title Even economically, disasters like Hurricane Sandy are bad things and was reprinted by permission.